Looks like I'm trading in the piolet for the paddle for awhile..
Hey, anybody have any info on hiking/hiking trails on Ilsa Espirtu Santo in Baja? Is hiking even allowed because it's a protected area? Specially, is the island highpoint hike-able or even accessible ? There doesn't seem to be much of any information out there on the web.. I'd appreciate any information you might share. As no one answered my original post, I thought I'd update it with some information that I obtained. 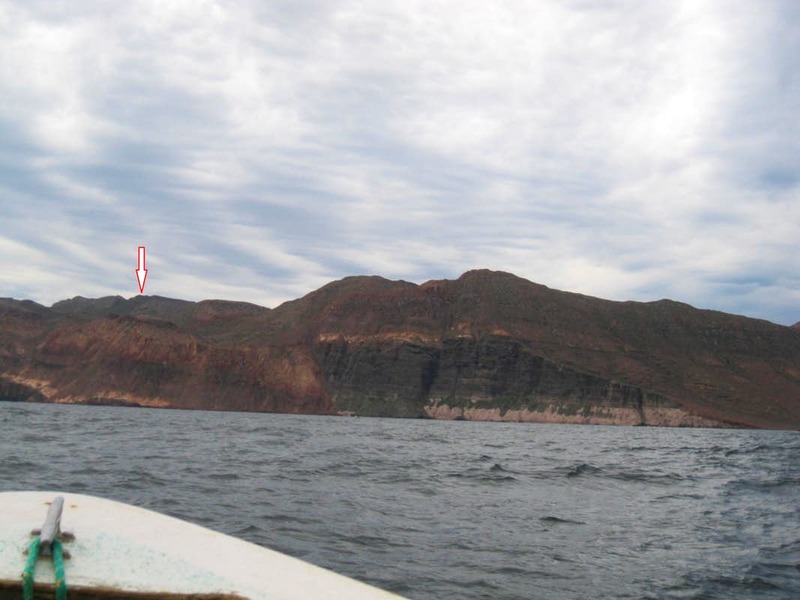 Unfortunately due to time constraints I wasn't able to attempt the Isla Espiritu Santo (IES) highpoint, but I am posting the info here in case some kayaking aventurero/a needs to feed the inner mountaineer whilst water-bound around the Isla. I spoke with a local kayak guide about the IES summit and she said that the rock quality is poor and that you need "need a rope" for the last section of the summit. FWIW, it sounded like she hadn't been to the top and needing a rope really could mean anything from easy class 3 (but possibly intimidating for the non-climber) to an actual, short technical pitch. From the view I saw from the east side of the Isla, it didn't look like there was much of a summit block. Google Earth didn't show much of a summit block either from what I could tell. It's possible she was trying to discourage me from doing any x-country travel on the island. Who knows?...Hell, one more good reason to strive, to seek, to find and not to yield. There seems to be two starting points to climbing the highpoint. Both places have beautiful camping beaches. 1. The Point between Isla Partida and Isla Espirtu Santo, aka Playa Partida. Here's a description of this area care of Baja Outdoor Activites IES boating/kayaking map: "There are two sand bars in the channel between channel between Isla Partida and Isla Espirtu Santo. On the northeast bar, up against the cliff, there is good camping. The huge crater walls that surround this area and the vast expanse of shallow water provide a spectacular view, and one can easily imagine how Partida and Espiritu Santo were one land mass before this volcanic crater was breached by the sea. It is possible to paddle though the channel to the east side of the island even at low tide." Note if you go this route, you will have to climb over the first ridge and likely down into a gulley/wash/canyon before accessing the next ridge to get up on the massif proper. I'm guessing this might take at least 3-4 hours one way from a Playa Partida camp. Note, there are two small fishing camps at Playa Partida, one on the Partida side and one on the Espiritu Santo side. There is also a park ranger "shack" on the IES side, if you are interested in the Juanito Law presence. Word on the beach was that the park rangers did not use the park hut very often. 2. Candelero. Here's a description of this area care of BOA once again: "Two stunning beaches with a spectacular ridge that splits the bay in half. It is easily identified by the small islands in the bay that make great areas for snorkeling. A 10 minute hike behind the northern leads to a well were you can rinse with 'fresh' water and a further 10 minute hike and you arrive at a dry waterfall, wild fig trees and spectacular over-hanging rocks." The BOA IES kayaking map shows two west-to-east trails from Candelero. One trail starts on the north side of the beach and one starts on the south side. Both trails join a little under half way across the island. FWIW, it looks like the south trail gets you closest to the highpoint. Obviously you will be doing some off-trail hiking when the trail runs out. 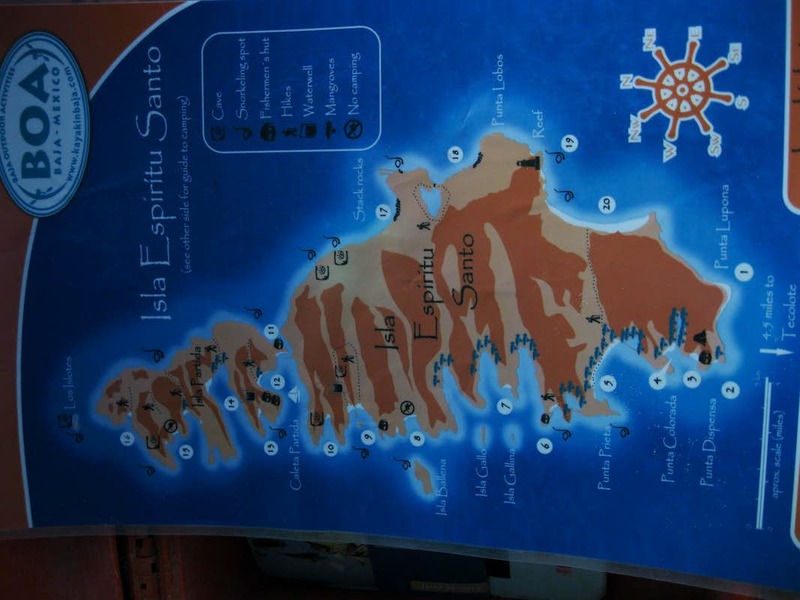 Is off-trail hiking allowed on Isla Espiritu Santo? "caminando a través de los senderos autorizados"
"No hagas nuevas veredas, utiliza sólo las autorizadas (ver mapa)." Based on the two translations from the two webpages above, it would seem that CONANP at least discourages off-trail hiking. Interpret what "new paths" means to you. If in doubt, ask a park official. FWIW, on the upper portions of the climb, you are probably going to be hiking a lot on boulders with minimal impact. Just a thought. 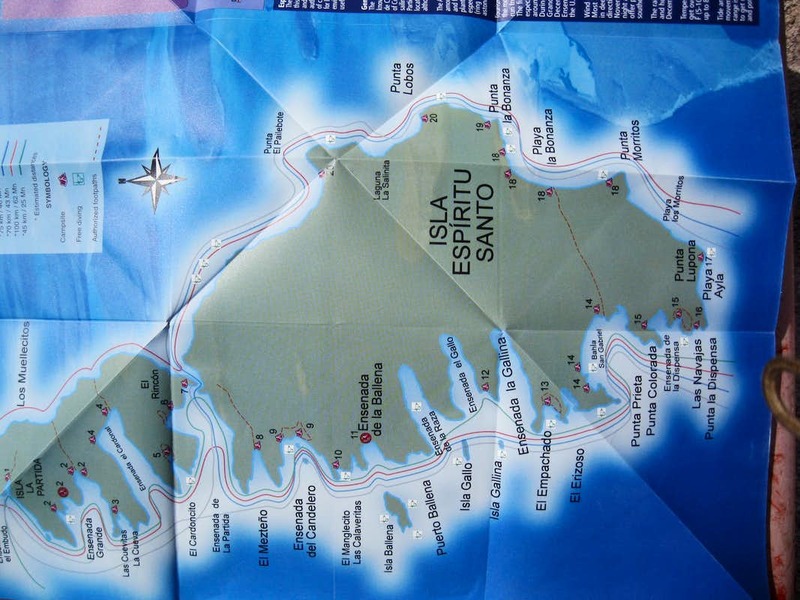 After doing a bit of searching the best paper map I could come up with for IES was the Baja Outdoor Activites Isla Espiritu Santo kayaking and camping map. The map is not topographic and not very detailed but shows the main bays and beaches. The back side of the map has a very useful beach camping guide. You can probably get a copy (free or fee?) if you stop in the BOA building on the north side of the Malecon in La Paz, B.C.S, Mexico. Page 21 of the Baja California Almanac shows some topo data for IES, but the scale is really too small to be of any use. The BOA map mentioned above is better. As a side note, the Baja California Almanac is a GREAT Baja travel/planning resource (especially if you are doing the paddle run from Loreto to La Paz (recommended)). Unfortunately, the Almanac is currently out of print. WTF? Did the publishers go bankrupt? The guide is in both Spanish and English and has good information on the beach campsites on Isla Partida and IES. 5 de Mayo #1035 Interior 1. Don't forget Google Earth for the satellite imagery. Finally, if you have a go at the summit, please post your experience/new information here on Summitpost. I'm going here for a week over Christmas, definitely inspired thanks to all your info. I will let you know how it goes.